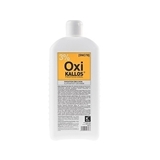 Kallos Hydrogen Peroxide Emulsion (3%) 1000ml. Description: Stabilized hydrogen-peroxide emulsion for hair-colour and bleaching preparations. For hair treatment select the emulsion with the concentration and quantity suggested in the instructions of the preparations. Instruction: Take care – strong formulation. Contains hydrogen peroxide. Wear gloves. Do not use metal containers or tools. Protect the eyes, mouth and skin. In case of contact with skin rinse immediately with plenty of water. Store away from children. Store in a cool place, protected against direct sunlight. 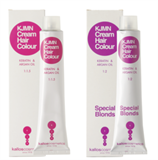 Kallos KJMN Professional Cream Hair Color 100 ml. Permanent cosmetic colouring that deeply penetrates into the hair structure with ease. The pigments in the presence of hydrogen peroxide react with each other, generating a colour that remains fixed for long in the capillary fiber. Maximum covering and maximum bleaching power; shiner brighter and more natural effects; more intense nuaces; long-lasting colour. 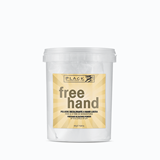 BLACK Polvere Decolorante Free Hand 450 ml. Take hair lightening into your own hands and get creative! With the new FreeHand Bleaching Powder you can unleash your creativity with a high level of precision, using freehand bleaching techniques.